The Chemex Coffeemaker, a pour-over apparatus invented by scientist Dr. Peter Schlumbohm 70 years ago, hasn't changed a bit since it was designed. It's the very definition of "if it ain't broke, don't fix it." So how did this quiet little device gain such a following? A German immigrant to the United States, Schlumbohm received his Ph.D. in Chemistry from the University of Berlin and moved to New York in 1936 (just as Hitler was consolidating his power). 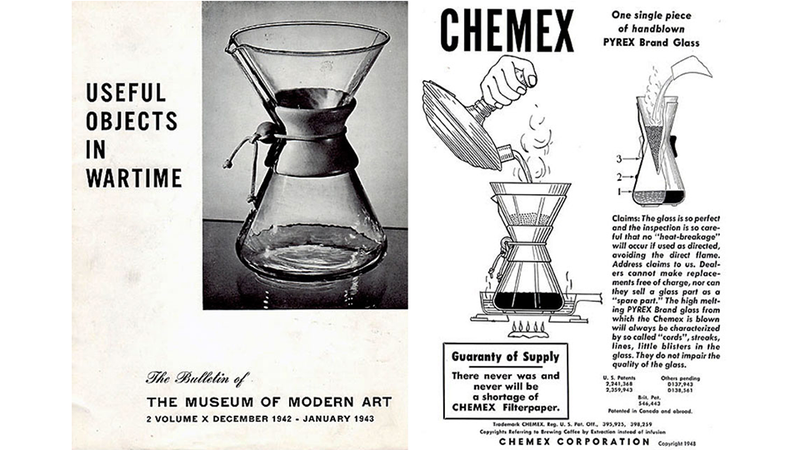 Despite his friends’ protests about the dire state of the American economy during the Great Depression, only five years later, Schlumbohm had invented his famous hourglass-shaped brewer; within a few years of securing his patent, the Chemex was available in department stores and through mail order catalogs around the world. Schlumbohm not only wanted to create a device to brew perfect coffee without a trace of bitterness, but also an elegant product that fit the streamlined aesthetic of Mid-Century Modernism.